Ulm, founded around 850 and a former Free Imperial City, is an fascinating city with a rich medieval architecture and history accompanied by modern attractions and exciting events. Ulm is primarily known for its church with the tallest steeple in the world, the Gothic minster (Ulm Minster, German: Ulmer Münster) and as the birthplace of Albert Einstein. 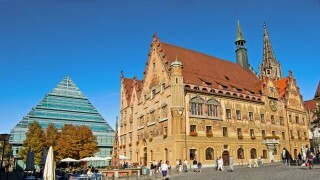 We gladly present you below the main places of interest in Ulm. 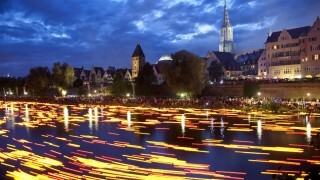 If you want to know more about what to see in Ulm, please ask our service directly. 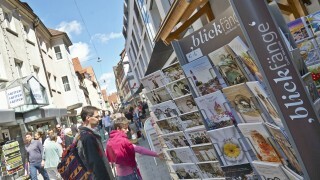 They will be happy to provide you more information on things to do in Ulm. The Ulm Minster is a symbol of the city and a masterpiece of Gothic church architecture. It took about 300 years to complete the construction work of the Ulm Minster. This magnificent work of engineering holds the world’s tallest church spire at a height of 161m.53 m (529.95 feet). Climbing the 768 steps up to the highest observation platform at 141 meters, you will be rewarded with a magnificent, panoramic view of Ulm. 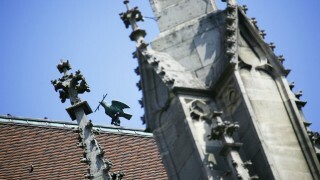 On a sunny day, you the guests can even see the Alps from the top of the steeple. The minster is also famous for its 15th century choir stalls by Jörg Syrlin and a number of exquisite art treasures inside the church. Stroll through Ulm’s old town, its narrow alleyways, along the many bridges crossing the River Blau and enjoy the special character of the former medieval free imperial city. In the Middle Ages the fishermen’s and tanners’ quarter was resided in predominantly by craftsmen. The restored quarter now boasts numerous restaurants, galleries and small unique shops offering an outstanding collections and unusual products. Here, in the Fishermen’s Quarter you will find famous sights as the Leaning House and the Oath House. 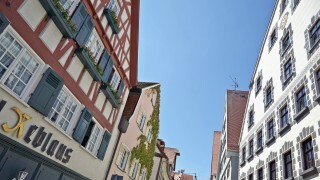 The Leaning House lies in the Fishermen’s Quarter over the river Blau and dates back to the 14th century. The small, timber framed house has an extreme leaning position, which arises from the unusual wide, sloping supporting beams. In 1995 the leaning house was completely renovated and has been used since then as a hotel. From the year 854 the building located on the wine yard was the site of the Kings Palace. Despite numerous historic changes and reconstructions, the place kept its symbolic meaning. Every year since 1397, on “Oath Monday” in July, the Lord Mayor of Ulm delivers a speech on the past year from the balcony of the Oath House and renews the historical oath on the town’s constitution. This oath speech is a start of the big official Ulm holiday. After the traditional major’s oath on the Oath Monday, the ‘Nabada’ river festival takes place in the afternoon. The colourful river procession of themed boats decorated and manned by various societies and groups swims down the Donube. They are accompanied by the lively music of various bands being carried on boats swaying away down the river. This day of watery fun culminates in festivities with live music and light show. 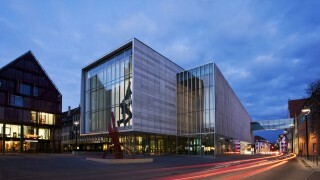 University of Ulm is one of the newest public universities in Germany. It focuses on medicine, natural sciences, engineering sciences, mathematics, economics and computer science and ranks among the top five universities in Germany for Electrical Engineering and Computer Science. We are glad to greet in our hotel students, theirs families, tutors and scientists on research travel. 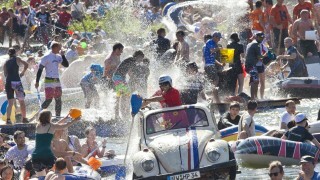 Every two years Ulm dives for 10 days into the atmosphere of arts and international culture. A sophisticated cultural program on both sides of the river – music, dance, literature, exhibitions etc. – represents the diversity of the Danube Region. Visitors can see authentic arts and crafts, traditional music and culinary specialties from different countries and regions. It is an exciting program for the entire family, young and old. The International Danube Festival is based on the idea of “unity in diversity”, promoting cultural exchange in Europe and strengthening the solidarity in the Danube Region.